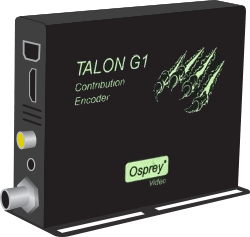 Stream high definition HD-SDI content over the LAN using SnapStream and the Osprey Talon G1 video encoder. Using H.264 means seamless playback with SnapStream's Native HTML5 player (no more plug-ins). Closed Captioning (EIA-608 & EIA-708) Type 1 ATSC Picture. 3.7" X 4.7" X .97"